Computational Complexity of Restricted Polygon Decompositions (A. Aggarwal, S.K. Ghosh, R.K. Shyamasundar). Computing Monotone Simple Circuits in the Plane (D. Avis, D. Rappaport). Circular Separability of Planar Point Sets (B.K. Bhattacharya). Symmetry Finding Algorithms (P. Eades). Computing the Relative Neighbour Decomposition of a Simple Polygon (H.A. ElGindy, G.T. Toussaint). Polygonal Approximations of a Curve - Formulations and Algorithms (H. Imai, M. Iri). On Polygonal Chain Approximation (A.A. Melkman, J. O'Rourke). Uniqueness of Orthogonal Connect-the-Dots (J. O'Rourke). On the Shape of a Set of Points (J.D. Radke). Ortho-Convexity and Its Generalizations (G.J.E. Rawlins, D. Wood). Guard Placement in Rectilinear Polygons (J.R. Sack, G.T. Toussaint). Realizability of Polyhedrons from Line Drawings (K. Sugihara). Voronoi and Related Neighbours on Digitized Two-Dimensional Space with Applications to Texture Analysis (J. Toriwaki, S. Yokoi). A Graph-Theoretical Primal Sketch (G.T. Toussaint). Computational Geometry is a new discipline of computer science that deals with the design and analysis of algorithms for solving geometric problems. There are many areas of study in different disciplines which, while being of a geometric nature, have as their main component the extraction of a description of the shape or form of the input data. This notion is more imprecise and subjective than pure geometry. Such fields include cluster analysis in statistics, computer vision and pattern recognition, and the measurement of form and form-change in such areas as stereology and developmental biology. This volume is concerned with a new approach to the study of shape and form in these areas. 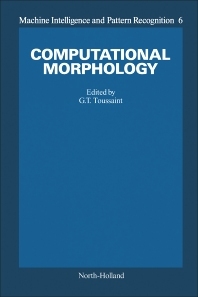 Computational morphology is thus concerned with the treatment of morphology from the computational geometry point of view. This point of view is more formal, elegant, procedure-oriented, and clear than many previous approaches to the problem and often yields algorithms that are easier to program and have lower complexity.